Where to buy a walking stick? 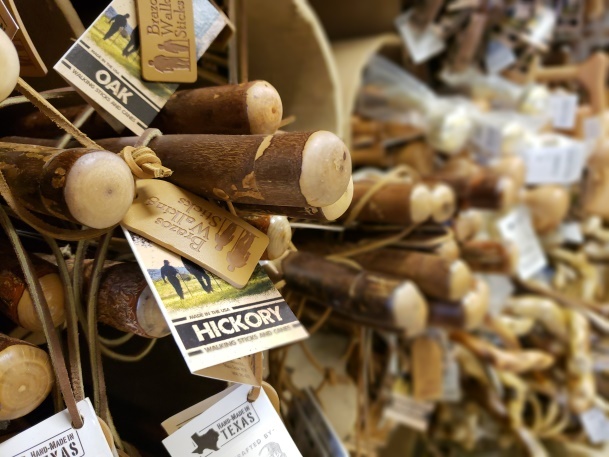 Ordering online is the easiest way of purchasing a walking stick or cane from Brazos Walking Sticks, which is located in central Texas’ Brazos River Valley region. Our mailing address is 6408 Gholson Road, Waco, Texas, 76705. How do you measure for a walking stick? Cane sizing is best achieved by standing up straight, relaxing your arm to the side and having someone measure the distance from wrist to floor. The information below is a suggestion that works for most customers, but consulting a doctor for additional advice is also recommended. For people who are shorter than 5’4″, we recommend our lighter 34-inch canes. For adults over 6 feet tall, we offer 40-inch canes. What are the differences in walking sticks? Walking sticks come in a variety of sizes, woods, finishes, shapes and handle designs as well as customization options that make each stick unique to the owner. All are handcrafted from solid wood and retain the rustic appearance that’s well-suited to outdoor use. What is the difference between a cane and a walking stick? The key difference between a cane and a walking stick is the type and shape of grip or handle that the user will grasp when using. A cane most often features a longer handle that fits into the palm of the user’s hand or a grip that is more subtle while still offering comfort and control. A walking stick more often than not does not have the pronounced grip or handle and uses a wrap or lace around the user’s hand along the vertical staff. What is the weight bearing capacity for your canes? While solid wood construction and the keen eye of our craftsmen will pick up any defects, there’s no universal weight limit for wooden canes. A properly-sized cane (see above) will help with balance and increase confidence, but shouldn’t be stressed beyond the boundaries of normal use nor to support the user’s entire weight. How heavy are walking sticks? Walking sticks made of solid wood weigh just a few pounds. How do you adjust a cane? The "switch sticks" folding walking stick line from Brazos can be folded down into four sections, which allows for easy storage for travel. Wooden canes and walking sticks are constructed from solid wood and cannot be adjusted or folded. What hand should I use my cane in? Left or righthandedness doesn’t factor into this. Experts say that you should hold the cane in the hand opposite of the leg that is injured or weak. This provides hand support in tandem with the leg as both travel together. Do you use a cane on the good side or bad side? Holding a cane in your hand opposite your weak leg provides for the most efficient means of movement and support. For an injured right leg, your left hand would move forward together with the right leg and act as another form of support. How do I remove the tip from my cane? Rubber ferrule tips attached to the bottom of a cane can easily be taken off by hand, as they are slightly pliable and can be manipulated more easily. The majority of spike tips are permanent additions to your cane or walking stick and cannot be removed. How long will my walking cane tip last? The lifespan of rubber walking cane ferrule tips are far longer than those found on cheaper drug store-variety items. A metal spike should last the life of your cane under typical conditions. Brazos is proud to offer a lifetime warranty on most items and will offer a 100 percent refund on a stick within 100 days of purchase. How do you use cane on stairs? Going up stairs, lead with your stronger leg, shift support to your hand with the cane the lift your weaker leg. When going down, place the cane down first then move your weaker leg followed by your stronger leg. What credit cards you accept? We have a number of different shipping options and fees. UPS 3rd Day to the continental U.S. is $25, 2nd day UPS shipping is $35 and next-day shipping from UPS is $65. There is a $20 flat rate fee for shipping to Canada and our expedited shipping cannot be applied to our crook canes or Shepherd’s Crooks. All in-stock items will ship between one and two business days. UPS, which handles delivery of our items, will be sent out in boxes. Important: UPS will not deliver to a P.O. box. How do I request my cane or walking stick to be cut? Brazos Walking Sticks prides itself on final products that come in a variety of woods, finishes, shapes, colors and designs. When ordering, you will be able to specify which size cane or walking stick is right for you. This ranges from the 34-inch cane on the small end to the 58-inch walking stick on the taller end. Customers must call us or write first before sending a product back for a return or exchange. We accept merchandise for refund or exchange as long as it is in its original carton or container, has all the appropriate literature, has not been used and is in resalable condition. Customers are also responsible for return/exchange shipping charges. Some items, such as the Brazos Bargain walking sticks, other as-is products engraved and custom orders, cannot be returned. We also offer a Guaranteed Quality plan that entails a full refund within 100 days of purchase minus a low restocking fee.